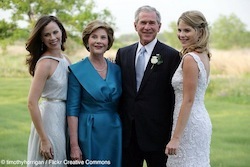 Jenna Bush Hager, daughter of George W. Bush and Laura Bush, is pregnant. This will be the first child for the former first daughter, 31, and her husband, Henry Hager. Today's contributing correspondent, Jenna, revealed the news on the show on December 12: "I'm nervous and so excited to say that Henry and I are pregnant, or I'm pregnant! We're so excited and obviously nervous about it," she continued. "I'm a first time mom but it's something I've always wanted. I'm a teacher and I love kids." "Hormonal," she quickly added with a laugh while fighting back a few tears. Jenna confirmed that the baby would be a springtime baby as she is already five months pregnant. Jenna's husband Henry then came out with a huge bouquet of flowers and a kiss for his wife. The segment continued with a surprise call from grandparents-to-be, President and Mrs. Bush. "We're thrilled, we're just absolutely thrilled," said Laura Bush. When asked about his reaction, President Bush said: "I'm fired up, lookin' forward to it. I'm excited for Jenna and Henry. I could barely contain the news when I found out, so now I can tell all my buddies." According to Mrs. Bush, Laura's cat Bernadette has moved in with them. Though no further explanation was given, our best bet is that Laura's cat is being cared for by her parents for the duration of her pregnancy due to risk of infection from toxoplasmosis. Congratulations and best wishes to the happy couple and family!